It’s January in the Land of 10,000 Lakes (Minnesota, for the uninitiated), and that means snow. Lots of snow. Unlike much of the rest of the country, we take the white stuff in stride — we have to. Snow is a weekly, if not daily, occurrence here. Yet Snow Days are the complete opposite — beautiful, seldom-seen things, like unicorns, and twice as rare. So when I got the news that we were shutting down Northern Brewer World Headquarters early due to the storm howling outside, I grabbed my coat and hit the door. By the time I excavated my car from nearly a half foot of snow and navigated through an obstacle course of oblivious drivers and bumper car intersections, I was ready to call it a day. Unfortunately, it was only mid-afternoon, and I’m a Minnesotan. Thirty-some years of deeply instilled Midwestern work ethic makes it impossible for me to knock off early. There was only one thing to do, chase the winter chill with a hot cup of coffee and get back to work. As I poured myself a cup of liquid fortitude, something caught my eye...a lonely bottle of neglected whiskey sitting on the shelf. Hey, I’m a Minnesotan, not a saint. Working from home during a snowstorm has its perks. Fill your cup ¾ full of coffee, stir in brown sugar until dissolved. Add one jigger of Whiskey, top with heavy whipped cream. Sprinkle with nutmeg, if that’s your kind of thing. Crème de menthe only upon pain of death. I hadn’t had an Irish Coffee in quite a while, and I have to admit I was enjoying it thoroughly. As I sat sipping my whiskey-laced coffee on company time, the January chill slowly being driven from my body, my mind turned to warmer thoughts. Why should the heavenly flavors of Irish Coffee be limited to the dreary winter months? For most people, coffee is a year-round essential. 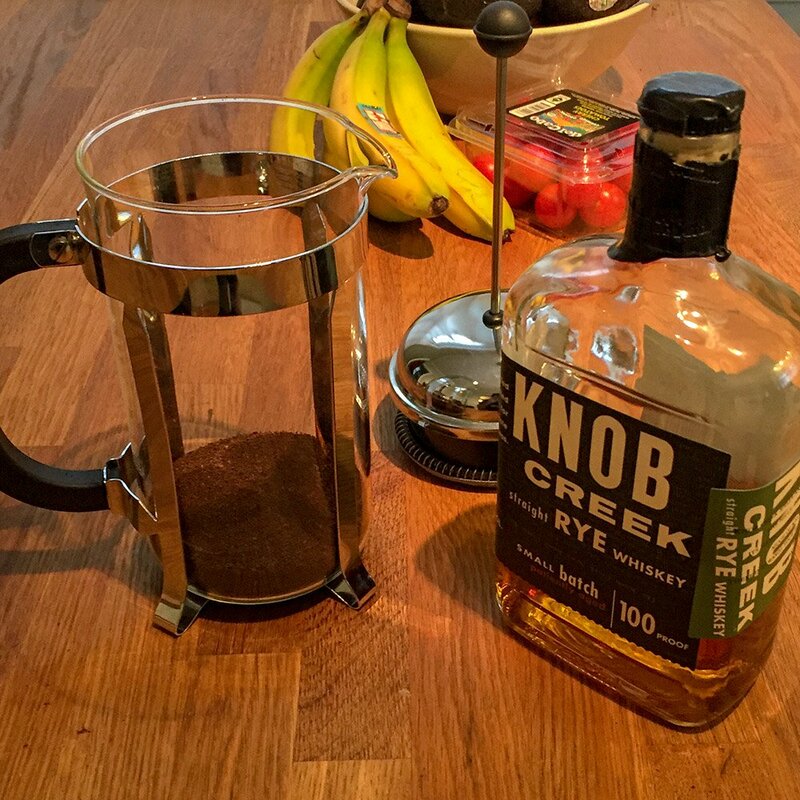 Could cold brew Irish Coffee be a thing? A quick search of the interwebs confirmed it, and a plan was born. Upon returning to work the next day, I talked with the crew in new product development and we tapped into some arduous tasting trials. Sigh...Our jobs are hard. Here is what we came up with: Using the Jacked-Up Cold Brew Kit brew a batch of cold brew coffee. This requires an overnight brew, but the taste is worth it. If using your cold brew for Irish Coffee, we recommend not including any lactose or sugar during the brew as you will be adding both later. Stir until chilled, strain and serve over ice, top it with off heavy whipped cream. Enjoy! Our Cold Brew Irish Coffee has the best of all worlds -- the mellow flavors of the original, in a creamy, easy-drinking, refreshing style. Best of all, you can enjoy it year round -- neat when it’s cold, iced when it’s warm...or any day you want a bit of Irish in you. To celebrate our grueling experiments and discovery, for a limited time we’re offering a Free Cold Brew Coffee Recipe Kit with the Purchase of a Jacked Up Cold Brew Kit. Stock up for your next Snow Day!